While leather boots are tough, they are usually greatly affected by water. If you work or walk in wet environments, your leather boots might start coming apart after a short time due to constant exposure to moisture. The cool thing is that you don’t have to damage your work boots as you can always waterproof your leather boots. You can waterproof your leather boots in a wide range of ways: using creams, waxes, pastes, and by using waterproofing sprays. Your choice should be informed by the product that is ideal for you. Using creams, pastes and waxes is usually the best way of waterproofing your work boots as the process is easy. For you to properly waterproof your leather shoes you need to get rid of all the dirt and mud that might be on the shoes. Dishwashing liquid is usually enough to do the work but if you want to complete the work fast, you should use a tube of footwear cleaning cream. You should scrub the work boots with a soft brush and then rinse the boots once you are done. Your next step should be to apply the paste to the leather shoe. You should be generous in your application and apply it in a circular motion. You should be cautious and ensure that you apply it in all areas of the shoe, including the seams. If any excess paste in left, you should use a piece of cloth to get rid of it. Once you are done, leave the boots overnight to dry. From its name, it’s made from Bee’s wax and it protects your work boots whether you are working in rain, sun, snow, or even salt. When you apply it, it dries into a solid wax that stays on your leather boot preventing water from getting in. I have observed that the product not only waterproofs the work boots, it also lubricates and conditions them. The beauty of it is that since I work in cold areas, the work boot doesn’t get stiff even when the wax solidifies. The main advantage of the wax over other waterproofing products is that it’s not made from grease, oil, or animal products. If you have been wearing leather work boots like me for a long time, you must have used waterproofing products made from oil, grease, and animal products. While most of them work, research has shown that they tend to migrate through the leather and they might clog the pores. According to the researchers, the products fill the natural spaces that are meant to absorb the sweat which makes the boots uncomfortable to wear especially when working in hot environments. Researchers have also shown that the animal fats also tend to weaken and rot leather over time. 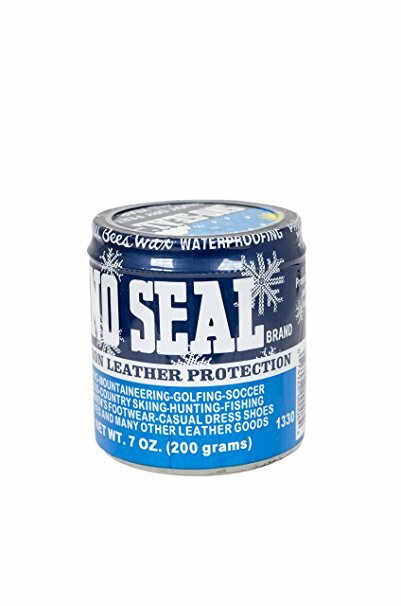 When you use Sno-seal waterproofing wax you don’t have to worry about the pores of your leather boots clogging up. To apply it you should follow the instructions I have given above. You should avoid using a lot of it at the same time as you risk the application process getting messy. It’s also made from a blend of beeswax/propolis suspension formula that not only protects your leather boots from water, it also provides you with protection from retardant chemicals, and abrasion. The waterproofing products work just well. It revitalized my old timberland work boots. When I hose off the work boots after work, the dust easily washes off leaving the boot looking untouched underneath. I have been using the wax for two years now and although my timberland work boots are old, the leather still looks great. From the smell, you can tell that the product is made from beeswax and other leather conditioning oils. The smell is strong, but not unpleasant. I applied the waterproofing product on my timberland boots two months ago and the boots still smell of honey. While I don’t have a problem with my boots smelling of honey, I wonder how the situation would be if you applied it on your leather jacket. Would you be reeking of honey for months? I have observed that the leather protector darkens the leather. It took the work boots more than a month before they could dry up and restore their original color. The product works best on dark brown and black leather. You can also apply it to other colors of leather without any issues as the color will come back once the product has fully dried. When you purchase the product, it comes with an applicator but I don’t like using it as it makes the process messier. I usually apply the product using my hands. Since it’s made from wax, it melts in my hands on contact with the body heat. I apply two coats then let the boot dry for a day or two. If you want your leather boots to dry faster, you should put them in a warm place. After drying, wipe the excess paste and use a horsehair to buff off the excess. You will have a dark sheen but you can always polish it if you want to. You should note that the paste will darken your leather, leave a honey smell, but it will be worth it as it gives your boots the protection that they need. Mink oil not only protects your work boots from water and oil, it also softens the leather and makes it supple. To apply it you need to apply it on your hands and apply it on your boots. The cool thing about it is that it’s not scented thus you don’t have to deal with unwanted smells after application. 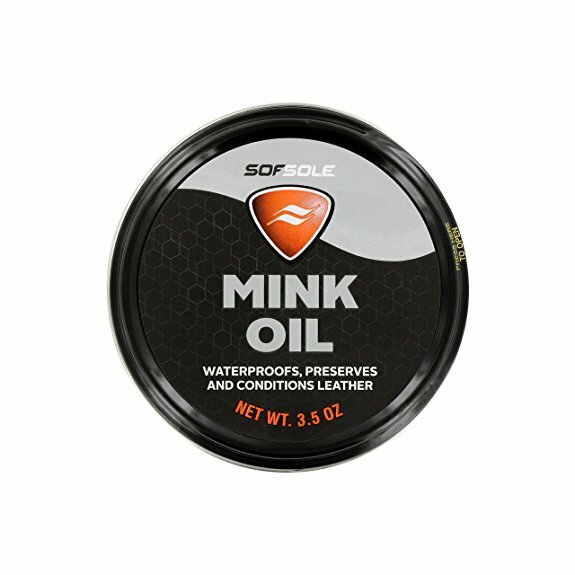 From its name, it’s made from mink oil that gets into your leather blocking it from any water that might try to get in. 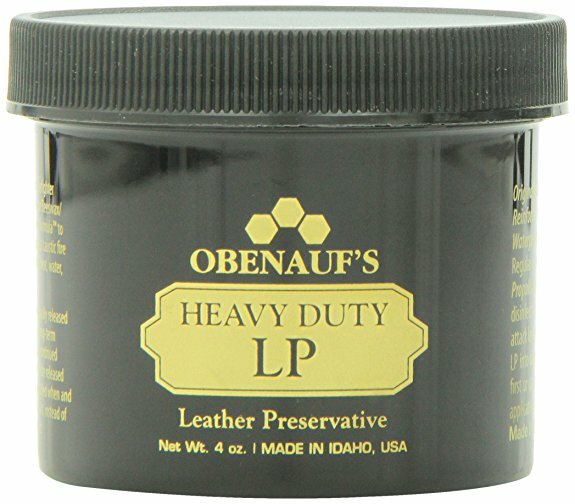 Unlike other waterproofing for leather products that I have used before, this product doesn’t stick to the hands. When I applied other products with bare hands, it used to go for days or even weeks before all of the materials could get off. Not with this one. You only need to wash your hands and all of the material will wash away. Just like any other product I have used, it darkens the leather after application but you only need to give it time to dry up and the original color will come back. After applying the product, you may have to buff the leather in order to remove the excess that you might have applied. If you don’t like the oil on your hands you don’t have to worry as you can always use the applicator that it comes with. I have to warn you that using the applicator usually results in wastage of oil. The honey is made using a formula that was invented over 50 years ago. Since it has been around for that long, it must be good. When you apply the honey, it penetrates into the pores of the leather protecting the leather pores and rejuvenates the old one. 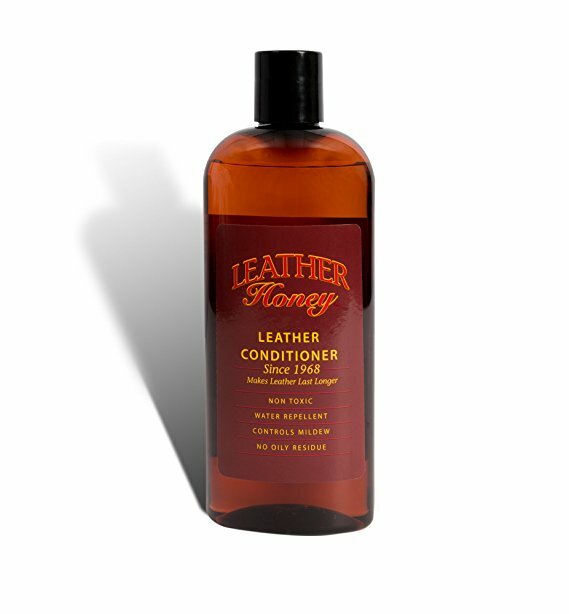 The honey also moisturizes the leather so that the boot is flexible even after application. The most amazing thing I noticed about the product is that you don’t need to keep on reapplying it every now and then like the other waterproofing materials. When I applied it once, I could go for months without worrying about re-application. It comes with an applicator but you can always use your hands if you don’t like to waste it on the applicator. After application, you should expect it to darken your leather, but you shouldn’t worry about it as the natural color will come back as soon as it dries up. The kit has everything you need to keep your work boots in mint condition. When you apply it on your leather boots, it soaks deeply in the leather giving the shoes all the protection they need. This protects your shoes from water resulting from the rain, mud, and puddles. The kit will also help you in repelling oil and stains that might give your shoes an ugly look. The cool thing I noticed with the kit is that it penetrates the leather shoe without affecting breathability. For you to apply the repellent you need to use a boot brush or textured applicator cloth that it comes with. You should apply it generously on the work boot. For ideal results, apply two coats. Using waxes and gels requires a lot of time. If you don’t have the time or you are feeling lazy you should use waterproofing sprays instead. For you to apply the spray you need to get rid of all the dirt from the work boots. You can easily do this using a footwear cleaning cream or soap and water. Once your boots are clean you should start spraying them. For you to avoid inhaling the fumes, you should hold the shoe at least six inches away from your body. When you are done, place the shoes in a dry place so that they can dry overnight. Kiwi has been in the shoe business for a long time thus you can have peace of mind when using the spray. The spray is aerosol and you can easily apply it on your work boots. Just like any other shoe spray on the market, you need to start by cleaning your leather boots. Once they are clean and dry, you should spray a light, even coat when you are 7-10 inches away. You should spray the boots in a ventilated area to avoid inhaling the fumes. After application, let the shoes dry for 24-48 hours. When you are applying it, it comes out wide and light which allows you to cover the shoe within just a short time. You should note a strong chemical smell when applying it, but the smell disappears when the leather boot dries up. Unlike other sprays I have used before, this spray didn’t cause any discoloration on the work boot. The one thing I noticed is that the boot hardened. The leather also wrinkled a little bit. Despite this, the results were splendid. While the spray is great to use, it’s not ideal for use in everyday clothing and office shoes. It’s designed for use on outdoor gear and footwear. For you to get the best results, you should avoid using it on materials that it isn’t intended for. The spray is made in England by one of the world’s leading outwear manufacturers. The spray relies on the fluorocarbon free technology that repels water from your shoe leaving your feet dry. According to Granger, you should apply the spray on a dry work shoe and you don’t need to activate it using heat. After cleaning the shoe and drying it, you should go ahead and apply the spray from a distance and in a ventilated area. 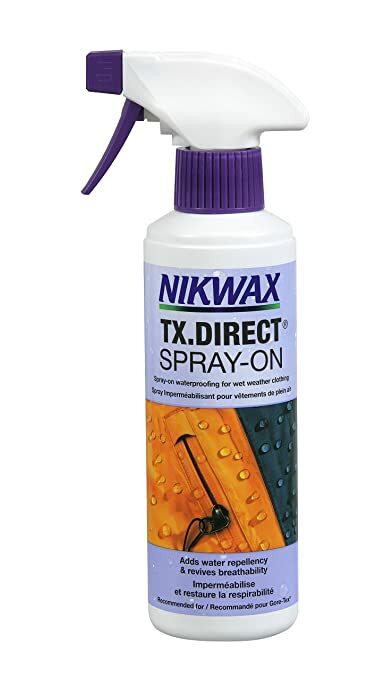 Unlike other sprays that have an aerosol nozzle, this spray has a trigger nozzle. The spray comes out wide and light which allowed me to cover the work boot within a matter of minutes; however, I noticed that the spray is a little heavier as it left some wet spots in certain areas. When it comes to the smell, the spray has a very strong chemical smell, but it fades with time, especially when the work boot has dried up. After applying the waterproofing spray, the leather become a little harder but no damage was made to it. Scotchgard is one of the most reputable brands when it comes to waterproofing materials. The chemicals used in making the spray are: propane, silicone, and petroleum distillates. There are no CFCs thus you don’t have to worry about damaging the ozone layer when waterproofing your work shoes. You should start by cleaning your leather shoe and after drying, place it away from surfaces that can be damaged by oversprays. You should shake the can and spray in a sweeping motion when you are 6-8 inches away from the work boot. The manufacturers recommend that you apply only one coat and be cautious that you don’t saturate the shoe. Once you are through, you should place the work boot in a dry place where it should dry. You should note that even after application, it’s common for the waterproofing feature to go away after some time. For you to retain the feature, you need to reapply the spray after a few months or as you want to. When applying the spray, the dispersion was very even and it covered the leather boot properly. Unlike other products, the spray doesn’t have a strong chemical smell; therefore, if you spray it outside, you won’t even notice it. The most attractive thing about the spray is that it comes in a spray bottle. This means that its free of fluorocarbons, propellant gasses, and other chemicals. 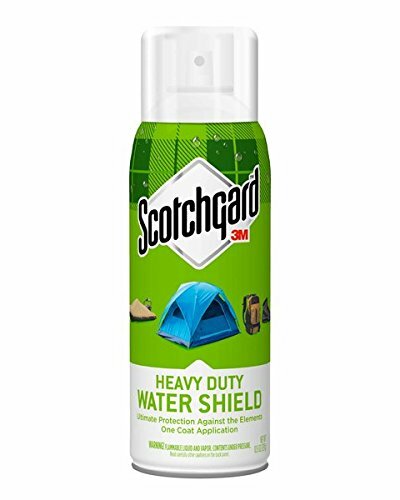 The main reason I bought the spray I because it has many great reviews on Amazon compared to the other popular brands such as kiwi and Scotchgard. You should start by cleaning your leather boots. You should then protect your working area by laying garments flat on the surface. Holding the bottle 6 inches away from your body, you should spray the boot evenly. You should wait for at least two minutes after which you should remove the excess spray using a piece of cloth. If there are any areas that you might have missed, you should repeat. When applying the spray, I noticed that the spray bottle tends to drip a lot. For you to reduce the spilling you should hold the bottle upright all of the time. The spray perfectly covered the work boot and unlike other waterproofing products that I have used before, it didn’t discolor the boot. The spray is perfect and I encourage you to make a purchase. The only flaw I noticed with it is that it has a strong vinegar smell. The smell lingers on the leather boot even after drying but it isn’t that strong. There are many reasons why you should care about waterproofing your leather boots. Although, leather is designed to be tough and can withstand a lot, it’s often destroyed by water. According to the art of manliness, water reduces the life of the leather by up to 50%. The leather is made from fat and proteins and tends to retain a specific amount of moisture after being tanned. The leather fibers that crisscross each other give leather its unique strength, but its susceptible to drying out when you don’t treat it with care. For the leather to last for a long time, you need to minimize the rapid influxes and moisture releases. When you waterproof your leather boots, you prevent water from getting in the boot thus it has a long life. The leather is not only destroyed by water, it’s also destroyed by salt and other harsh chemicals. These chemicals tend to stain the leather and as you might have guessed, they are difficult to get rid of once they have permeated the leather. If you don’t remove the stain early enough, it not only gives your boot an ugly look, it also tends to discolor the shoe and weaken the top layers of the leather. The other benefit that comes with waterproofing your leather boots is that you have comfort when wearing it. Since no water gets into your shoe, your feet are dry all the time. This comes in handy in ensuring that you are comfortable when you are on your feet the entire day. There are many waterproofing compounds that you can go for. 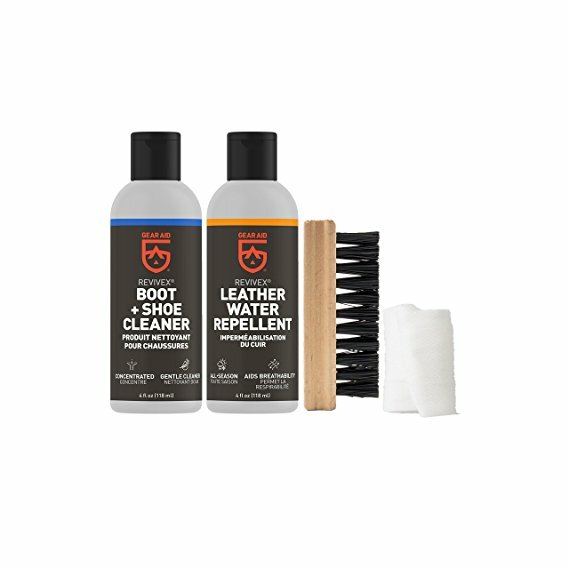 Wax-based polishes: Unlike the shoe creams and pastes that are designed to nourish the leather, the wax-based units are made to create a shine which gives the work boots a thin protective layer that not only protects your boots from water damage, they also provide protection against salt. Brands such as Lincoln and meltonian provide high-quality polishes that come in a wide range of colors and sizes for you to choose from. For you to achieve the best results with the polishes you need to reapply the product after every few wears. If you are working in extremely wet areas, you should apply the wax after every wear. Specialty waterproof compounds: Two of the compounds that perfectly fit this category are the ones we have mentioned above: Obenaufs heavy duty leather preservative and Sno-Seal weather protectant. When you properly apply them, they perfectly protect your work boot thus ensuring that no water gets in. The cool thing about them is that unlike polishes, they last for a long time. When you are using them, you should note that they don’t create a shine; therefore, you can always use them in conjunction with a polish, especially when you are looking to give your shoes the shiny look. Spray on waterproofing compounds: Different people have different feelings about using waterproofing sprays to protect their leather boots. Some people argue that the sprays block the leather pores thus the shoes don’t breath as effectively as they should. Others argue that the silicone used in making the sprays is harmful not only to the leather, but also to you—the person applying it. While there are some sprays that will destroy your leather boots, there are some that are highly effective and you should definitely go for them. We have mentioned some of the best ones above, you should give them a look. When you are using the sprays you should note that they aren’t meant to penetrate the leather, but to provide a protective coat. This means that you need to reapply the waterproofing after a few wears. Even after doing all the research about the best waterproofing for leather boots, chances are that you might not buy the right product. For you to have peace of mind that you are using the right product, you should test it. All you need to do is to choose a discreet part of your boots such as the heel or the side of the shoe’s tongue. You should ensure that the product doesn’t discolor your shoe. If it does and gives you perfect results, you should ensure that the change isn’t extreme. After you have tested and you are confident that it’s the product that you want to use, you should clean the boots, prepare the surface for waterproofing, and go ahead and waterproof your boots. You should apply the water resistant compound generously to ensure that you form a watertight barrier. For you to get the most from the waterproofing sprays, you need to consider a number of tips. Before you apply the spray, you should first wash the leather boot. When you clean the leather boots you remove the oils and dirt that might be blocking the leather pores and would prevent the spray from properly sealing the shoe. Once you are done, you should dry the work boots. As mentioned above, you should avoid placing the leather boots near a source of heat as you risk damaging them. The best way out is to leave them outside and let them air dry. You should then pick the leather boot and apply the waterproofing spray evenly and consistently. When applying it, ensure that you are a few feet away from it. This is to prevent yourself from inhaling it. You should apply the waterproof when you are outside. You should cover the area that you are spraying so that you don’t damage it with the waterproofing product. You should cover the surface with plastic bags. You can also place an old piece of cloth on the surface. After applying the first layer, you should let the leather boots dry completely before you apply the second layer. Most of the high-end waterproofing sprays won’t require you to do this but if you are using low-end products, you should highly consider using applying the second layer. The second layer improves the effectiveness of the waterproofing feature thus your boots remain protected for a long time. If you have properly waterproofed your leather boots, it’s rare that you have to worry of your shoes getting wet, but if you have stayed for a long time without waterproofing them and it rains when working, you can’t escape the wrath of the shoes getting wet. When you are caught in the rain, you should work at removing the excess water as soon as possible. You can easily do this using a dry rag or towel. You should use the material on the outside of the leather boot. The next step should be to pull the moisture from the inside of the boot. You can achieve this using a newspaper or small dry towel. For ideal results, you should draw the moisture out every hour or so—depending on the extent of the moisture. Once you are done, let the leather shoes dry at room temperature. Some people put them near a heat source so that they can dry faster—this is wrong. You should note that heating them causes the moisture to leave the leather too fast which increases the chances of the leather cracking. Once the shoes are dry, you should clean and condition them using leather balm or cream. You should then polish them. For you to maintain the look, you should clean and polish them after every wearing, over the next few weeks. These are some of the best waterproofing for leather boots that you should go for. As you have seen, there are many products on the market that you can go for. When buying the products, you should always go for high-quality units that will not only give your boots an elegant look, but those that will also last for a long time. The last thing you want are units that will get exhausted after just a short period of use. As mentioned above, low-quality products tend to require you to use two or more layers; therefore, they get finished fast. High-quality waterproofing products on the other end require you to only apply one layer thus last for a long time. When you are applying the creams and sprays, you should exercise caution so that they don’t get into your eyes or inhale them for long period of time. Remember that the products are made up of a wide of chemicals that can be harmful to you. If you feel that you can’t apply the waterproofing material by yourself, you should hire a cobbler or any other professional to help you out.